On Sunday, three bunko friends and I threw a baby shower for Julia, who is expecting her first born this fall! The shower was a hit, but the sweetest part of all came home with us hostesses: Julia made us gift baskets with peach jam and a sack of six delicious, ripe, sweet Georgia peaches from the Peach Truck! 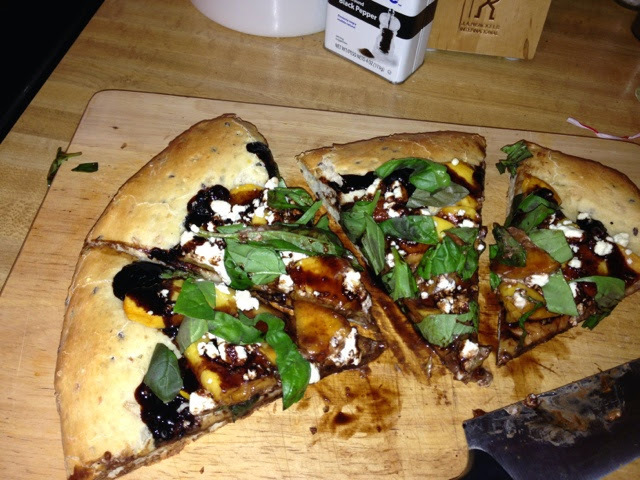 and last night, we made a peach pizza! 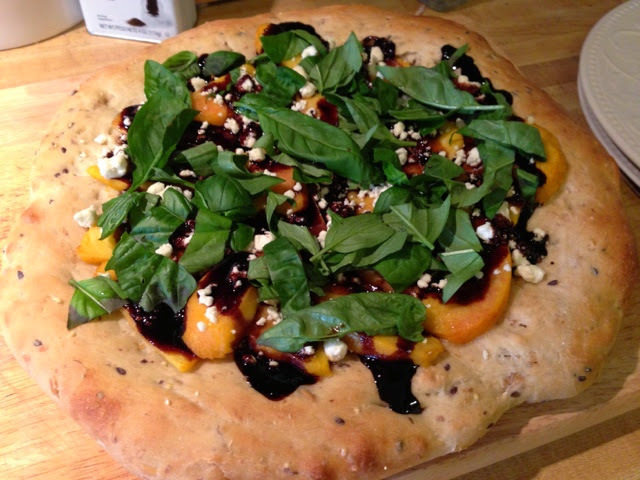 Publix whole wheat pizza dough, two peaches thinly-sliced, some crumbled goat cheese and balsamic glaze that I picked up from Trader Joe's. The whole thing was topped with fresh basil from Matthew's little garden. Not gonna lie; that pizza was delicious. 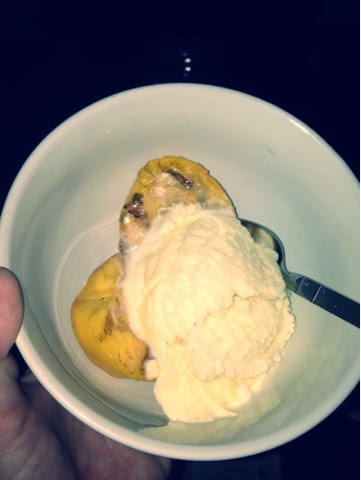 Any peach dishes I need to keep on file for next time? I will crawl, walk, run my way back into blogging. I waver between stopping altogether, and keeping it going for posterity's sake. Until I decide what to do, let's start with something easy: a recipe. 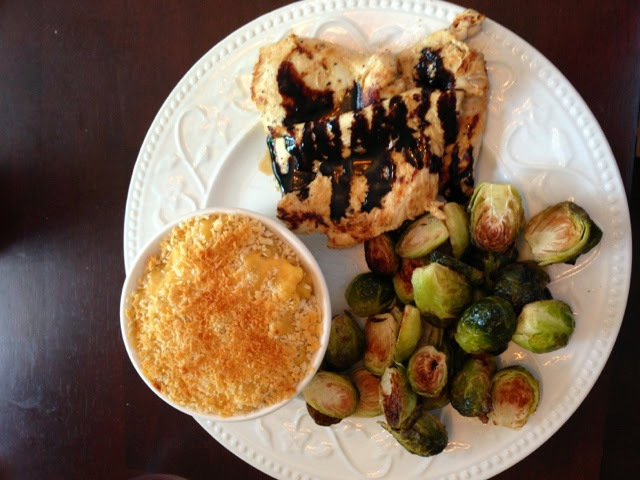 Brussels sprouts get a bad rap. Today, I am going to tell you how to make them so well that you will want to eat them all the time. 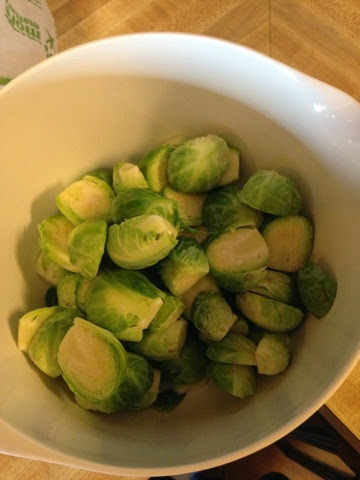 We saw this recipe on America’s Test Kitchen and sometimes I find myself craving Brussels sprouts like a regular herbivore. Who’d have thought? The geniuses at America’s Test Kitchen, that’s who. First, get your hands on about 1 lb (ish) of sprouts. Wash them (some leaves will fall off; that’s okay), cut the root off, and cut them in half. Inspect each half: little brown holes usually led to some bigger bad spots a leaf or two down. Don’t be afraid to get in there. Add 3 tablespoons of olive oil and 1 tablespoon of water into the bowl. 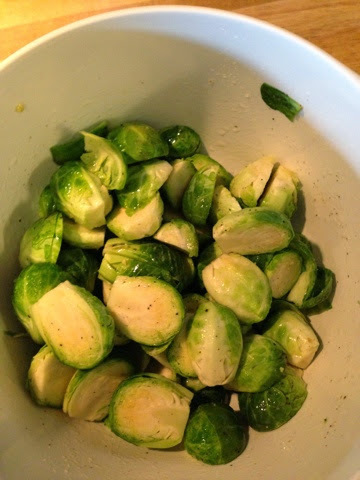 Toss the sprouts and season with some good chunky salt and a little pepper. Next, preheat your oven to 500 degrees. It sounds too high but it works, trust me. 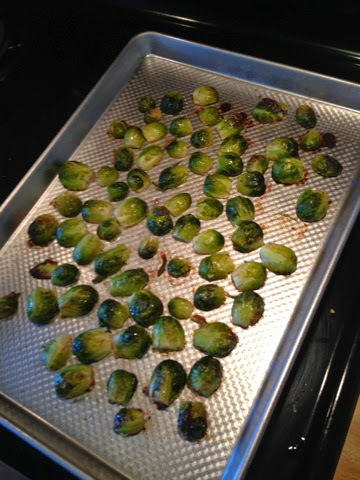 Here’s the catch: place the sprouts CUT SIDE DOWN on a rimmed baking sheet and cover it tightly WITH FOIL. Roast them in the oven for 10 minutes, then take the tin foil off. Leave them in for another 10 to 12 minutes (they will be charred if you go the full 12 minutes but that’s my favorite way to eat them). 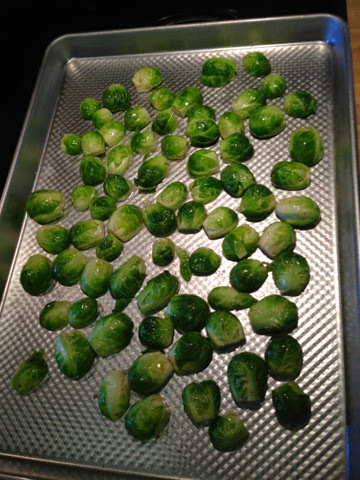 Thanks to America’s Test Kitchen, I learned that adding water to the sprouts basically steams them in the little tin foil incubator, cooking them all the way through. Then, you take the foil off and char the suckers and viola! It’s like eating candy. And just to keep it real, no matter how good your roasted Brussels sprouts are, they will never, ever be as good as an individual ramekin of homemade mac and cheese.